Assigned to the 5th Air Force, 43rd Bombardment Group, 63rd Bombardment Squadron. 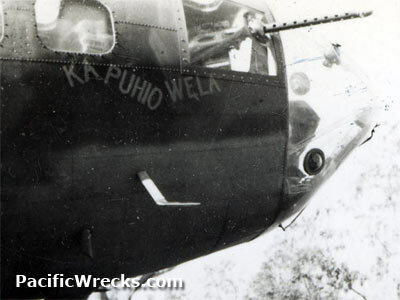 This B-17 was nicknamed "Ka Puhio Wela" (Hawaiian for "Double Trouble") on the right side of the nose and "Double Trouble" on the left side of the nose. No known nose art. On January 1, 1943 one of six B-17s that took off from 7-Mile Drome near Port Moresby piloted by 1st Lt. Woodrow W. Moore on a early morning attack against Lakunai Airfield near Rabual at 4:20am. Inbound to the target, one B-17 aborted the mission. Over the target, this bomber had an unsuccessful bombing run and the bombs were salvoed over Simpson Harbor instead. On March 3, 1943 took off from Mareeba Airfield during the Battle of the Bismarck Sea with B-17F "Lulu Belle 41-24358 and another B-17 on a bombing mission against a Japanese convoy of transports and destroyers bound for Lae. Over the target target at approximately 10:30am this B-17 and two others were attacked by enemy Zero fighters. During a firing pass, one of the Zeros hit the cockpit section causing a fire to ignite inside the fuselage that extended out the waist windows and tail. Damaged, this bomber released its bombs (reportedly at a target) and seven were observed to bail out. From B-17 "Lulu Belle" flying alongside at roughly 7,000' a photograph of the stricken bomber. Of the seven that bailed out, one fell out of his parachute harness and fell to his death. The other six parachutes deployed successfully but were strafed unmercifully by "clipped wing" [A6M3] Zeros. At 1,000' the tail wrenched off and floated downward. The rest of the bomber crashed into the sea. A few moments later it sank beneath the waves. "A fortress from the 63rd Squadron [this B-17] was hit by flak. The flak just blew a tail off the ship and she started down. There was no saving her. It was dreadful to watch. Then six of her boys jumped. Their chutes opened and they started to float down. From nowhere, like vultures leaping on a wounded rabbit, the Zeros dove. They had been hiding up above in the clouds. They didn't aim at us or any of the other Forts but at the six men in chutes. They killed them, all right. I watched that, feeling cold and sick, and I said to myself. 'That's all, brother, that's all. Now I know. I know what we're fighting now. Not men - beasts." "The four officers and one man remained in the plane. 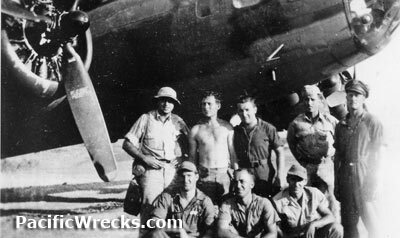 The bombing run was completed and the pilot pulled the plane up a little out of formation. He gave a salute and a big smile and headed the plane down for the water. The plane was observed to break in two pieces at an altitude of approximately 300 feet. This plane went down in the middle of the Jap convoy. Much strafing was done in this area later and anyone alive could quite possibly have been killed by our own planes." 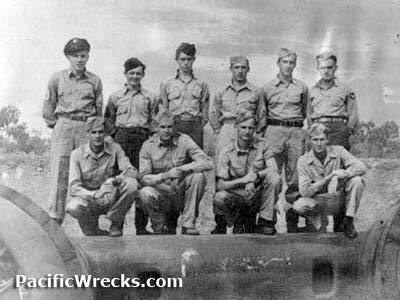 After the loss, the entire crew was recommended for the Silver Star. In the end, the officers aboard were awarded the Silver Star and the enlisted men the Air Medal, posthumously. 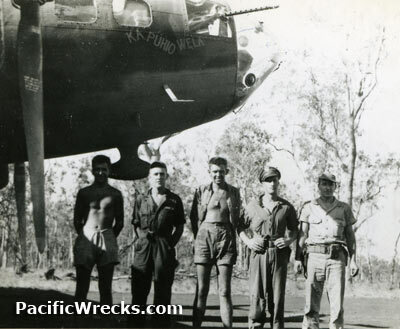 Alfred F. Westphal was also awarded the DFC, unsure if it was for this mission or a previous one. Wilson has a memorial marker at Riverside Cemetery in Dillon, SC. Note, his date of death is incorrectly listed as March 4, 1944. McCamy has a memorial marker at Cedar Hill Cemetery, Scottsboro, AL.